Welcome to my website. I have been working, training and teaching with horses for over 30 years and never stop learning. I have been very fortunate to meet and train with many brilliant teachers and trainers. They have all taught me so much and have complimented each other with their training. Combining what I have learnt from them all over the years, has been invaluable and I am very grateful to them all. I was inspired to learn more about body awareness and the Alexander Technique by Mary Wanless over 30 years ago. I have found this knowledge has given me an ability to really understand what riders need to learn, but, is often not taught. When I teach, I work on both the horse and rider together. 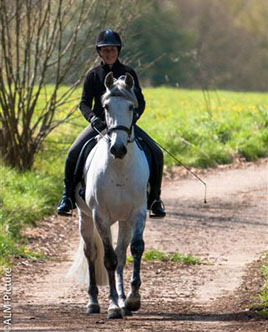 Riders must be prepared to work on improving themselves and then the horse can progress confidently too. It’s all about understanding how the horse and rider balance together to become a harmonious trainable partnership. In 1987 I became a life member of the Training the Teachers of Tomorrow Trust. 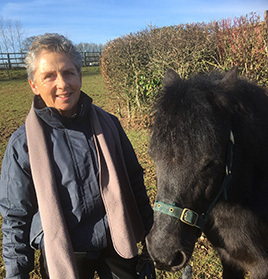 The trust was set up by Tom and Jennifer Sewell to give instructors the opportunity to really learn about Classical Dressage Training and to train with top international trainers. Back then, it was very difficult, so the trust was a unique place for learning with continuity and had a busy annual programme of clinics, lectures and demonstrations. The TTT has given me 30 years of training, support and friendships that I’ve been very privileged to have had. Sadly the TTT closed after 30 years on 31st December 2017.
very regularly over the past 30 years. Having access to these trainers regularly has been a real privilige and given me much knowledge to pass on to others. The Trust has also had a selection of in-house trainers who have given super clinics regularly every year. Alex Cookson, who carried on the trust from her parents, will hopefully continue to teach at East Whipley Farm, home of the trust. I have enjoyed training with them all, especially Alex. 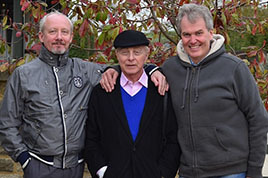 I have also been fortunate to attend training seminars with Gerd Heuschmann, an expert on equine biomechanics. His seminars are always very interesting and Gerd is always bringing new research to his presentations. In 2015 on a seminar in Munich, I met Manolo Mendez, he was one of the six founder members of the Royal Andalusian School of Equestrian Art and it’s second in command. He was amazing to watch working with the horses and I’ve been lucky to have continued to see him annually since then on his visits to England. My trip to Munich inspired me to learn about Acupressure. 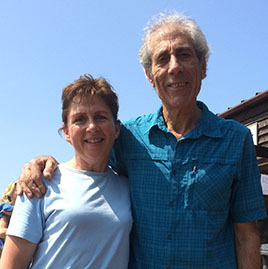 The late Dr Kerry Ridgway and Manolo worked together for two days and the results were amazing. I trained my first horse from a just backed youngster to PSG with the TTT and Andrew Day. I did compete regularly with my mare up to advanced level and had a fun and successful time. Since losing her I have found myself with horses that needed remedial training to recover from injury or bad training. Not intentional, life just took me that way. So competition has not been my priority and I have not been competing as regularly for some years. It is more important and rewarding for me to have a happy, comfortable horse in training than to be out competing. But, I would do more if I had the right horse. 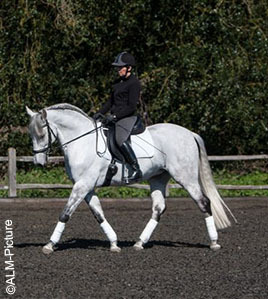 Classical dressage training is the progressive development of the riding horse, using a proven system that has been passed on through generations. The combination of this training and also the knowledge I have gained from having a horse that needed much remedial help to recover from a serious injury, has given me a very holistic approach to my work. Dressage is referred to as an 'art' because, when well done, the horse is transformed by the rider. It looks more beautiful and moves more gracefully and the horse and rider move together in harmony. Most people will be riding as a hobby, sport, recreation, but, however you look at it, we should all try and learn to ride in a way that enables the horse to move comfortably and without detriment to its body. It is important to me to train the horse to use its muscles in a way that enables it to carry a rider and develop gymnastically without force or gadgets. When a horse is comfortable in its body, you can see and feel a softer and more supple movement in its back and limbs. A horse moving with a stiff back and joints is not just uncomfortable to ride, but is 'breaking down'. The rider has to develop a quiet, supple, harmonious seat. They must have good self awareness before they can hope to train a horse and feel what it needs. The rider must 'hear' the horse through their seat. When I teach I work on helping the rider to develop these skills. Discomfort, soreness and pain in a horse is often misinterpreted as 'bad behaviour'. People have described their horses as naughty, stubborn, fresh etc, when I have found it is just saying Help! Riders with position problems or badly fitting tack will have great difficulty in getting their horse to work well, or, sometimes the horse is suffering from an unsoundness that has not yet been detected. I aim to teach riders how to 'listen' to their horse and understand how to train them in a way that they can both enjoy being together. I teach people who do dressage to compete, but, also many more who event, show jump, or just hack out. They all want the same thing - a horse that is nice to ride, feels happy and has a better chance of staying sound and healthy.